Three sisters, all witches, and all hiding the truth of who and what they are from everyone else. In alternate New England in the 1890's, these three sisters are all they have. Their mother is dead and their father is always away on business. Their secret abilities aren't something to be desired - they are something that will get them killed or sent away to an asylum. Cate is the oldest and has only a handful of months to declare her intent to marry or to go live with the Sisters. Not her blood sisters, but the group of women who serve the Brotherhood. Cate must protect her sisters and their secret from the Brotherhood, Sisters, and even their father. How can she do that while taking care of another man and his house or off learning prayers and devoting her life to a bunch of priests? I am happy to say that this is not just a pretty cover kind of book! I enjoyed the characters, the plot, and the fictional setting of a high society town in New England who is under the religious thumb of hypocritical do-gooders. Cate was a wonderful character to get to know. She is hellbent on keeping their witchy background a secret, but she quickly learns that she is pushing her two younger sisters away. She is like the mother that doesn't want her children to grow up and she thinks she is protecting them when in reality, she is smothering. Watching her walk that fine line of parent and sister was captivating and heart warming. Cate has to make a choice between marrying or becoming a Sister. There aren't many choices for a girl in 1890, and Cate is at a crossroads. We are led to believe one thing about the Sisters, but about halfway through the book, we get more information on who they are and opinions may change - mine did! Cate could marry Paul, her oldest friend, who has returned to town from his studies in the city. Everyone expects it and he is good to her. Her sisters support this idea and Paul seems to understand how much Cate needs to take care of them. She isn't quite sure about the whole love bit. He doesn't make her heart jump and her palms sweat and the roses bloom (magically). Only one boy does, Finn....the gardener. A girl like Cate has no business having relations with a gardener and the son of a book store owner. To put it simply, he is beneath her in every way, but she has a head of her own and can't ignore her heart. The relationship between Cate and Finn (and Finn's mother) is adorable. I love a good love triangle and with so much at stake, this one is terrific and climatic! That ending was.....! I'm looking forward to not only about Cate's jaw-dropping story line, but also her sisters. Her father has got to be up to something and I hope we learn a little bit about why he is always away on "business." I can't wait to read about the reactions to the ending of Born Wicked in book two- wow! 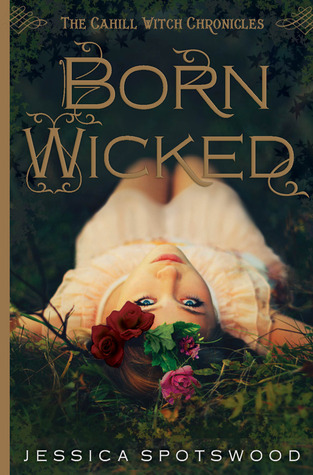 If there was a "Book Cover of the Year Award," I think Born Wicked has a shot at winning for 2012! This photo is simply stunning and it definitely caught my attention last year. I had the pleasure of talking with Spotswood about the cover last year. You can find that interview HERE.